Pilates and the happy, neutral spine. Next time you go out look around and find someone 10 to 20 years older than you are. Is their spine straight or bent? Are their shoulders slumped forward? Are their middles lifted or kind of falling out? What’s the big deal about having a straight spine? The easiest and most superficial answer is: it just looks better. Standing up tall does wonders for your looks; it even makes you look thinner and we all love that! To look a little deeper, think of how the doors and windows of your house would work if the walls bent and shifted from their intended place. Things would stick and just not move as smoothly. Eventually they would stop moving all together and maybe even break. Looking further yet, your spine protects part of your central nervous system (the brain is protected by the skull). Peripheral nerves come out between the vertebrae of the spine and travel throughout the body. These nerves travel not only to fingertips and toes but to all your organs as well. Anything you can do to keep communication free and smooth is a good idea. Structural changes in the spine can also cause pain and long term poor posture can lead to chronic pain. When the spine is no longer neutral it no longer distributes weight properly. Excess pressure settles in more localized spots which become overly compressed. Over time these compressions can start irritating nerves causing discomfort and pain which can become chronic. Furthermore, a non-neutral spine will eventually stay that way. The vertebrae stop moving and the entire spine gets stuck in that shape, drastically reducing mobility. An overly bent upper spine makes it hard to lift the arms over the head, causes neck pain, and eventually tingling in the fingertips. An overly tilted pelvis (generally posteriorly which flattens lower back arch) limits the range of motion of legs making walking less stable and with a smaller stride, causes pain the lower back, and eventually tingling/pain/numbness in toes/legs. How do you know if your spine is neutral? When viewed from the side, proper posture involves alignment of earlobe, shoulder, just behind the hip, front of knee, and ankles. An easy way to test yourself is by using a wall. Bring your buttock, shoulders, and back of the head on the wall; heels may be about 2 inches away from the wall but still in line with the pelvis as mentioned above. There should be small arches in the lower back and neck. If you look down you should be able to see your pubic bone; if you do not you have too much arch in the lower back. One of the things that makes Pilates different is its insistence upon a neutral spine. While all movement should be done on a long spine, that is hard to maintain during really high intensity, heavy weight lifting, and other sports which have long term, repetitive motions on a flexed spine, etc. Pilates work, while eventually very challenging, places great emphasis on learning where neutral spine is. This concept also includes correct positioning of shoulder blades and pelvis. If all three are not where they should be, exercise merely reinforces (and sometimes creates) misalignments. It would be similar to supporting leaning walls and bent door frames. 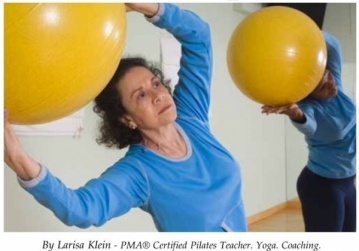 The big thing about Pilates is this: everything that you do is to create a super strong and stable neutral spine. You won’t be the strongest or most flexible, but it will keep you pain free long after looks no longer matter.